SANTA CRUZ, Calif., June 1, 2007 -- Atomic spectroscopy has been performed with integrated optics on a chip for the first time by guiding a beam of light through a rubidium vapor cell integrated into a semiconductor chip. Atomic spectroscopy is a widely used technique with diverse applications in astronomy and astrophysics, biomedicine and forensics, among other areas. Based on the interactions of light and matter, spectroscopy is often used to identify substances by the wavelengths of light they absorb or emit. Conventional systems have many large components, whereas the compact, fully planar device developed at at the University of California, Santa Cruz (UCSC) enables the study of atoms and molecules on a chip-based platform with integrated optics, said Holger Schmidt, associate professor of electrical engineering, whose group collaborated with researchers at Brigham Young University . According to Schmidt, potential applications for the first monolithically integrated, planar rubidium cell on a chip include frequency stabilization for lasers, gas detection sensors, and quantum information processing. "To stabilize lasers, people use precision spectroscopy with bulk rubidium vapor cells. We could build a little integrated frequency stabilization chip that would do that more easily than a conventional frequency stabilization circuit," Schmidt said. That project is already under way in Schmidt's lab. Other applications, such as quantum information processing, are more long-term goals, he said. The key to the group's achievement is their development of hollow-core optical waveguides based on antiresonant reflecting optical waveguide (ARROW) principles. Schmidt and his collaborators' previous work has involved other uses of ARROW waveguides integrated into chips using standard silicon fabrication technology. 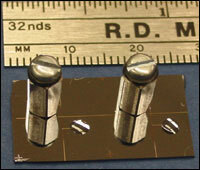 To perform atomic spectroscopy, the researchers incorporated rubidium reservoirs into a chip, connecting the reservoirs to hollow-core waveguides so that the optical beam path is filled with rubidium atoms. The resulting vapor cell is completely self-contained and has an active cell volume about 80 million times smaller than a conventional cell, Schmidt said. "We used rubidium as a proof of principle, but this technique is applicable to any gaseous medium. So it has potentially far-reaching implications," Schmidt said. In addition to its use in laser frequency stabilization, rubidium vapor is widely used in quantum optics experiments and has been used to slow the speed of light. "Fundamental concepts in quantum information processing have been demonstrated in principle using bulk rubidium systems. To be practical you can't have big optical tables in all the places you would want to use it, but now we can make this technology more compact and portable," Schmidt said. A paper describing the research appears in the June issue of Nature Photonics. Lead author is Wenge Yang, a postdoctoral researcher in Schmidt's lab at UCSC's Baskin School of Engineering. Joining Schmidt as coauthors are Donald Conkey and Aaron Hawkins of Brigham Young, as well as UCSC graduate student Bin Wu and postdoctoral researcher Dongliang Yin. The research was supported by the National Science Foundation and DARPA's Slow Light Program.